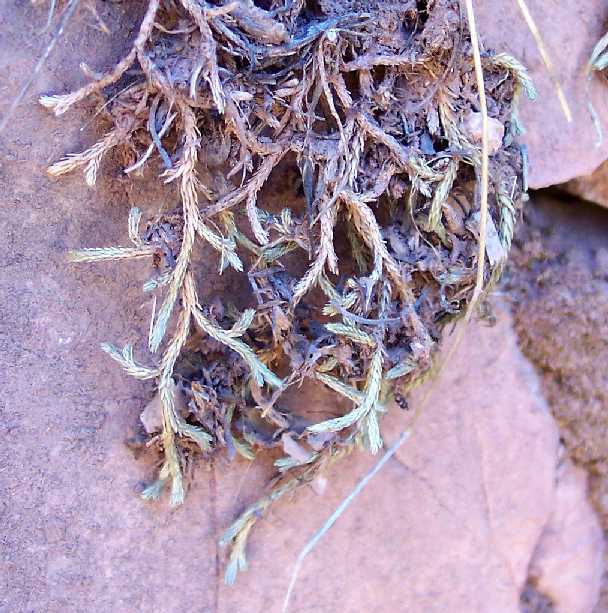 This is the most common spike-moss in the Grand Canyon Village area, found on the Hermit Trail, Bright Angel Trail, and South Kaibab Trail from 3000 to 6000 feet elevation. 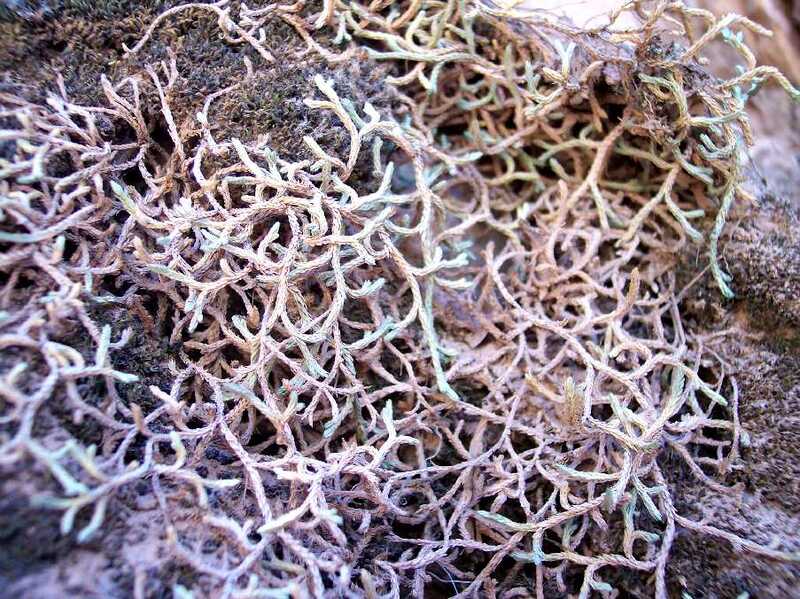 There is one other spike-moss species on the South Rim, S. underwoodii, which has bristles at the tip of its leaves. One other species, S. watsonii, is only found at the North Rim; it is the common species in the mountains of southern California. 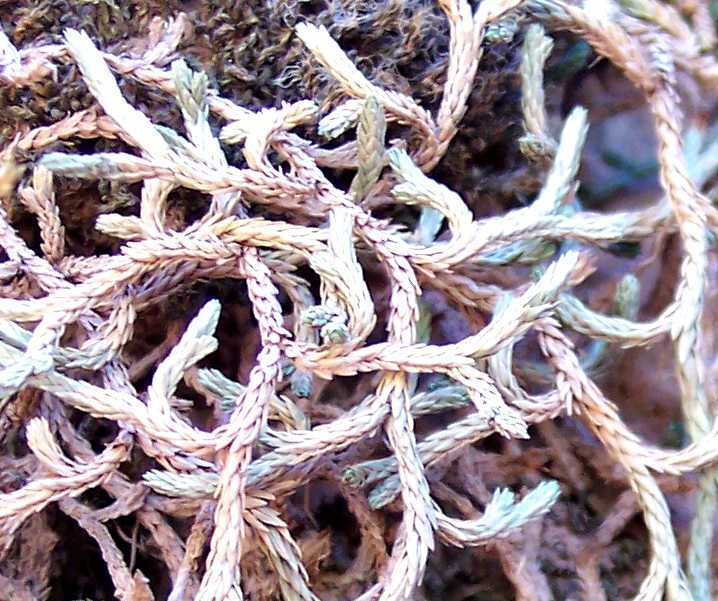 Spike-moss is sometimes known as resurrection plant, since it turns green when it receives water, and slowly becomes dormant and fades to ~gray when water is absent. 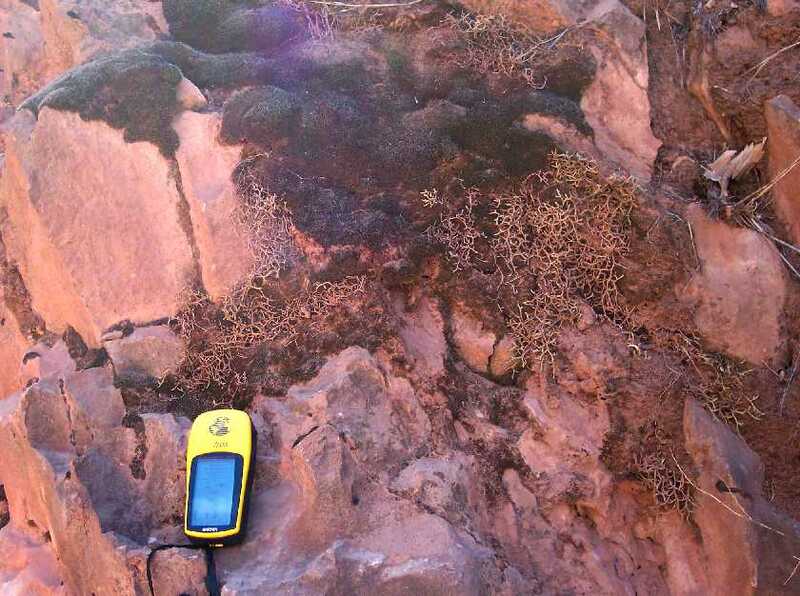 It can survive a very long time, in very dry and hot conditions, waiting for rain to come again. 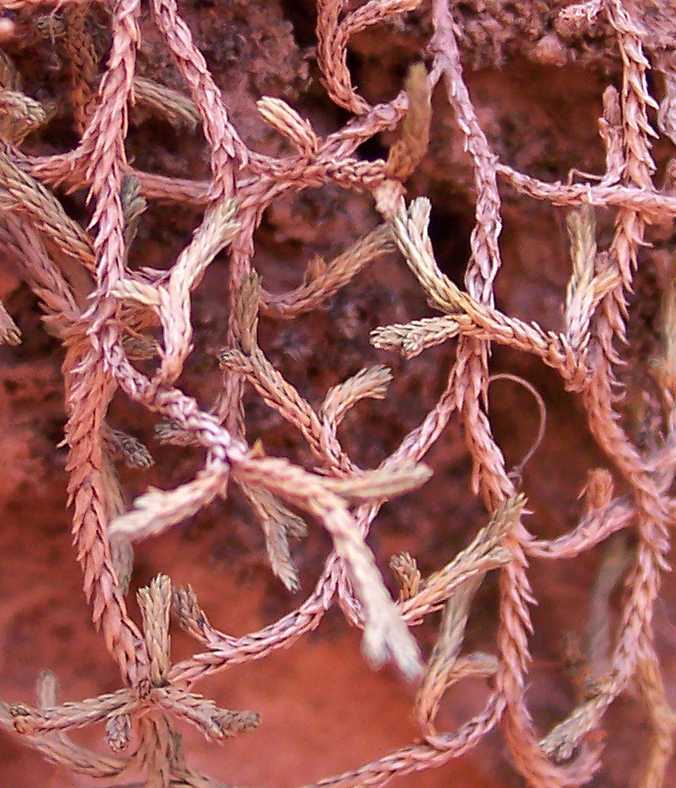 Spike-mosses are primitive plants, but they do indeed have a vascular system to carry fluids throughout the plant. It is interesting that at least some floras done in the early 1900s generally did not include these primitive vascular plants or ferns. They are not even included in McDougall 1964! From a SEINet search on 28 September 2007, there are 13 vouchers of this species from the Coconino County portion of the Grand Canyon, including one from this trail at an unspecified location. Note that there may be additional vouchers at other herbaria not available through SEINet. First occurrence on Bright Angel Trail: mile 3.09 (off-trail), elevation 4663 feet (1421 m). Number of plants along Trail: Only the single off-trail occurrence has been found so far; no plants have yet been found on trail. Fortunately, the plants are only 10 feet off-trail or so, and can easily be reached. In the next picture, the black plants are true moss; the intricately-branched lighter plants are spike-moss. Both turn green when it rains, and slowly fade to black and gray, respectively. Note the absence of bristle-tips on the leaves in the following pictures. 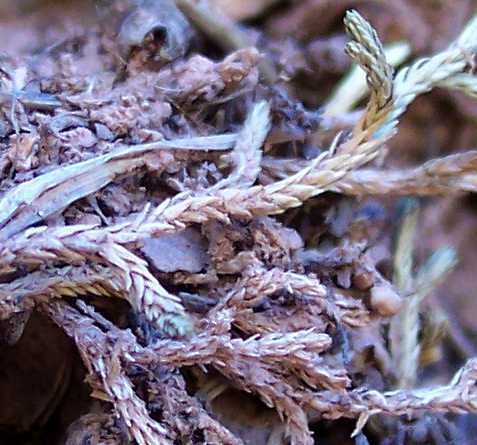 Many spike-moss species have bristles that would be clearly seen in such photographs, especially when they form bunches at the ends of the stems where the young leaves are bunched together. These bristles are one easy way to distinguish some of the species. This species is distinguished by the absence of the bristles. The leaves look like they have an acute tip, but if you look carefully, especially at leaves seen from the side, you can see that most of the tips are blunt, albeit quite narrow.